This is a really lovely northern Rhône Syrah, made by Maxime Graillot, son of Alan (the most famous grower in this appellation of Crozes-Hermitage). It's quite an edgy, polarising sort of wine, though: with its high acidity and bold, striking flavours, some will fall in love while others will find it a bit too much. It's just my sort of wine. I'd much rather have these somewhat wild, untamed flavours that speak so clearly of the place it comes from, than something more polished and accessible. Jamie Drummond on Food and Wine: Episode 12 - Jamie Goode from GoodFoodRevolution on Vimeo. Just on my way back from Sarah Ahmed's 50 Great Portuguese Wines tasting. Having done this job last year, I know how difficult it is to narrow down this selection to just 50: Portugal must be the most underrated wine-producing country on the planet. Sarah is pictured above, with one of her favourite whites. Sarah's selection was excellent. I think we have quite similar tastes in terms of preferred styles, opting for precision and elegance over raw power. But while there was inevitably some overlap with last year’s top 50, I made a few new discoveries from her selection. And this year saw more whites than ever before, which I think is a good move. The Quinta das Bageiras Garrafeira Branco 2007 from Barraida was brilliant. For me, it was the pick of the whites, with precision, minerality and complexity. Also stunning were the Quinta de Saes Reserva Branco 2008 from Dão and Dirk Niepoort's Redoma Reserva Branco 2008 which will likely age brilliantly. I should also mention the superb Po de Poiera white 2008 and the dense, bold Pera Manca Branco 2007 from the Alentejo. I was really taken by the MJC Colares 2005 with its sappy, fresh cherry fruit profile. Lovely wine in a lighter style, and nice to see something from this tiny appellation. Filipa Pato's Lokal Silex 2008 was probably the red wine of the tasting: beautifully precise and perfumed with elegance and power, like a great Burgundy. Her dad's Vinho Barrosa 2005 Barraida is an incredible wine, too: dense, structured, spicy with a hint of mint and eucalypt – massively concentrated. Filipa is pictured below. Falorca's T-Nac 2007 shows how beautifully perfumed Dão Touriga can be. Alvaro Castro is a Portuguese legend, and his Pellada Reserva 2006 Dão showed really well, with power, concentration, freshness and elegance. Also from the Dão, a new wine to me was the dense, taut, Touriga-dominated Vinha Paz Reserva 2005. To the Douro. Niepoort's Redoma Tinto 2007 is fresh, bright and focused with some stern structure hiding under the pretty fruit. This will age very nicely. Jorge Borges (above) was present showing his Passadouro Reserva 2007, and it's a brilliant example of the Douro at its best, with a tight minerally core to the focused, structured dark fruits. Quinta da Crasto's Vinha do Ponte 2007 is a remarkably complex wine, albeit one made in quite a ripe, forward style with noticeable oak. Still, there's no doubting its complexity and interest. It was nice to be able to try a back vintage of Quinta do Vale D Maria, the 2004. This is opening out and developing, and is now sweetly fruited and elegant – probably the right time to drink it. Just a quick note to say that I'll be moving servers over the next few days. I've outgrown my previous hosting service. Too many readers; too much traffic. Not a bad problem to have, but it does mean that there will be a short period where the site is down. I apologise for this. It's called DNS server migration, and there's no way around it. Just been on to amazon and ordered a book recommended to me by Ted Lemon, who was at Pinot Noir 2010. Ted's wines are fantastic, and so anything he wants to put on my reading list is fine by me. It's called 'Agroecology', by Miguel Altieri. Not cheap at £30, but I'm hoping it will be very good. On the flight on the way back from Auckland I caught a few films. Here are my amateur reviews. 1. In The Loop (www.intheloopmovie.co.uk) is utterly brilliant. You must see it. I almost cried laughing at several places. Malcolm Tucker is an utter genius. This is one of those films you can watch several times and still find something fresh. But it's not for those who are sensitive to profanity. 2. Star Trek (uk.rottentomatoes.com/m/star_trek_11/) is a pile of poop. Sorry. It's Hollywoodized to oblivion. I can't believe I watched this. And I can't believe that it gets 94% on rotten tomatoes. The plot is ludicrously bad, with parallel realities and people coming back from the future. A bigger is better, and biggest of all is best mentality has totally ruined this film. 3. Bright Star (uk.rottentomatoes.com/m/bright_star/) isn't a pile of poop, but it's disappointing. A run of the mill period piece charting the failed love affair of John Keats and his neighbour Fanny. Lots of old costumes, unrequited love and early death by consumption. Just a few more pictures from my recent trip. The glorious views over lake Wanaka from Rippon, Central Otago (above). This is an aerial view showing Kawarau (left) and Pisa Range (right, with its distinctive black poplar trees), in Central Otago's Pisa district. This is one of the black poplars at Pisa Range, this time viewed from the ground. Does having a nice experience of a country bias writers, even subtly? Keith P posed an interesting question in response to one of my blog posts from New Zealand. To paraphrase: does having a nice experience when visiting a wine region of country introduce a degree of positive bias in subsequent reviews? Let's put this another way. Would it, in fact, be better for wine critics to have samples sent and taste the wines blind in a relatively neutral environment, such as their offices? There are a couple of well known critics who 'don't do vineyards', for example. Is their coverage more objective? Are wine reviews done in large, blind peer-group tastings of c. 100-150 wines per day in some way more professional and therefore more useful to readers because they are shorn of such biases? I don't think there's a simple answer to these questions, and I certainly don't claim to have all the answers. But here's my current thinking. Visiting wine regions and vineyards, and meeting with the people behind the wines, is absolutely vital if a writer is going to be able to make useful comments about the wines. Wine is more than simply a liquid in a glass that we, as critics, measure in much the same way as a Foss WineScan might do. I had a great time in New Zealand and met some great people. My coverage of New Zealand wine will be better for it. I'm also aware that positive experiences can lead to a desire to big-up the wines a little, but I have visited enough regions now that I'm aware of the danger of thinking that the latest region visited is the next big thing - just because I have been there. I also think large, blind tastings have problems of their own - often the results that come from them frequently seem a bit odd when you know some of the wines included well. They are useful, certainly, but they are not the final word. The job of the wine communicator is to tell the story of the wine, as well as evaluating it. Pictures above: top two - the gold mine sluicings at Mount Difficulty (Central Otago), viewed from the restaurant and also from above (you can see the winery from the aerial picture); bottom picture is of a vineyard in Gibbston, Central Otago. So I'm on my way home. Two weeks on the road is probably enough: I'm missing home. Still, it has been a great trip. I'm pictured above flanked by Andrew and Katharine, with whom I have spent two very enjoyable days. I wish we lived nearer to them. I'm now sitting in the lounge at Auckland airport, sipping a very precise Man O'War Sauvignon Blanc 2008. Next time I come here, I'm going to have to visit Waiheke Island. Their Syrah was one of the high spots of the Syrah symposium last week. New Zealand Syrah and Pinot Noir have a bright future. The future of New Zealand's fine wine dimension is very much in the hands of producers such as Pyramid Valley, Dry River, Bell Hill, Rippon, Felton Road and Ata Rangi (this is just a short list...there are many more) who focus on quality to the point of obsession. And two star turns are cool climate Syrah and Pinot Noir. Interestingly, some of the warmer-climate Pinot Noirs and the cooler climate Syrahs share a certain style. It was interesting to try a Syrah/Pinot Noir blend from Cambridge Road (Martinborough) that was far from the disaster it sounds: it was actually pretty good. My last couple of days in New Zealand are being spent with some friends in Auckland, The Hemingways. We knew them well in the UK, but a decade ago they moved out with their five children to live here. It has been great fun. Their kids are now, with the exception of one, teenagers and young adults, and there's a real positive vibe in the house. Where they are living, some way out of the centre in west Auckland, is pretty and leafy. We're just taking it easy, swapping stories, and drinking some nice wine and playing some guitar. Their son, Oscar, is a musical genius. He plays guitars and keys wonderfully, and sings well, too. His band will make it big sometime soon, I'm sure, if there's any justice in the world. On Saturday morning they run a market, bringing together loads of crafty people to sell their wares, so I went along with them. Pictured top is Oscar busking; just above is my buddy Andrew with two of his girls. Auckland, like Wellington, seems quite an easy city. Perhaps all of New Zealand is easy? Wellington is an easy sort of city to hang around in for a few days. It’s big enough to have all you’d need, but compact enough to get around easily by foot. The waterfront makes it easy to navigate – as long as you have an idea where it is, you’d find it hard to get lost. I’ve enjoyed my short stay here a lot. Last night was the Pinot Noir 2010 gala dinner, which was a grand old affair. I was sitting next to Nick Stock on a table at the front. Nick got picked on by one of the comedy duo the Topp Twins (topptwins.com) who worked the crowd wonderfully. They had the minister for health, Tony Ryall, on stage – he seemed a good sport as he was humiliated by them mercilessly, but he clearly has a great sense of humour. There were also a couple of singers performing, who are likely very famous in NZ, and I should really know their names, but I don’t (one was Elizabeth Marvely). 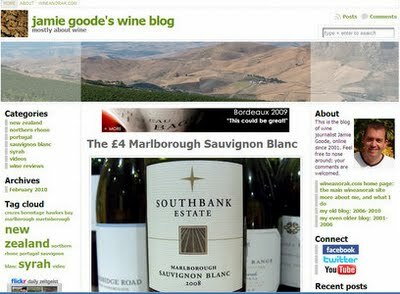 Oz Clarke also did a perfectly judged speech where he urged New Zealand not to go down the same road as Germany and Australia, by cheapening the image of its wines in the UK by selling bulk Sauvignon at £4.99. If New Zealand Sauvignon becomes cheap (the ‘savvalanch’) then its Pinot Noirs won’t be taken seriously. Considering how many people were attending, the food was brilliant. The wines were good, too, and many people had brought special bottles along with them. Mike Weersing, Blair Walter and Nick Mills all popped round to Nick and I to give us pours of some interesting bottles that they’d brought. Before the end, we were milling around, socializing. The highlight of this trip has been meeting so many great people. Wine is about places; it’s also about people. As well as the winegrowers, I’ve met many fellow writers and commentators for the first time, and they are a great bunch of people. While my colleagues with more stamina headed off to Havana. I bottled it and caught a good night's sleep. Enough is enough. A great conference. Last day of Pinot Noir 2010. I'm feeling tired - you have to remember that this is not an academic symposium. It's largely about eating, drinking, meeting people, having fun and generally partying. I was out last night with a small group of winemakers and journalists for a fun party hosted in someone's home. We drank some beautiful wines and bantered until late. Max Allen brought his mandolin along, and there was even some singing. All very off the record. Now I'm feeling quite tired, and also a little distracted that blogger, the service I am using for this blog, is no longer supporting ftp uploading of files. This has very big implications, and means that I'll likely have to move to wordpress. The transition isn't too daunting, but it means that, as only a moderate technical person, it will take me quite a long time - a currency I am a little short of at the moment. Talking of Max, I liked some of the comments he made about tasting wine yesterday. They chime with one of my favourite rants: the wine is a whole. Our language for wine is reductionist, trying to tease out components, rather than looking at the whole. We spend to long thinking of the nose of the wine in isolation, when really we should get it in our mouths and assess the texture and structure, considering tastes and smells together at the same time. Yesterday began with a bit of R&R - Tyson Stelzer, Joe Czerwinski, Oz Clarke and I had opted to go crayfish and paua (abalone) hunting on the rugged wairarapa coastline. So we set off at some unearthly hour and headed out for the sea. It was too rough to actually go in the water, but fortunately the boys had brought along some crayfish and paua that they'd collected earlier, Blue Peter style. After we'd spent some time getting friendly with the local seal population, they got their stoves out and we had a really nice late breakfast, washed down with some nice wines. Abalone was delicious, done two ways - as fritters, and sliced and fried. The crayfish was simply prepared but beautiful. Great fun. A bit of a change. After visiting beautiful vineyards, I've been stuck in a room all day. But productively. It has been the Syrah Symposium here in Hawkes Bay. A mixture of science, tasting and opinion. A tight schedule, running from 8 am until 6 pm, with four excellent tasting sessions blended in with the talks. The first, led by the excellent Rod Easthope (Craggy Range) looked at New Zealand Syrah. The second, led by Dan Buckle of Mount Langhi Ghiran focused on cool-climate Australian Shiraz. The third, presented by Jason Yapp, featured six brilliantly chosen wines from the Northern Rhone. Finally, Tim Atkin chose ten Shiraz/Syrah wines from around the world (deliberately excluding France and Australia). After the symposium, many of us went to Steve Smith's pad for a BBQ, with imperials of Le Sol 2005 and Block 14 2004, both of which were suberb, with my preference being the latter. Nice to be able to chat to Brian Croser and Brian Walsh, as well as the Craggy guys. The details of the Syrah symposium will have to wait for another time. I'm exhausted and we have an early start in the morning. Four very good visits today. Pictured above, Neil McCallum of Dry River, whose wines are just incredible. I met with him - an engaging, interesting host, and Poppy and Shayne Hammond (below), winemaker and viticulturalist, respectively. The team here is doing a fantastic job. The viticulture at Dry River is immaculate, with a split canopy system, total leaf pluck in the fruit zone, and reflective sheets under the vine to allow extra UV exposure to the developing bunches. Then off to see another of the region's stars: Ata Rangi. Pictured above are Phyll and Clive Paton. The wines are beautifully expressive. Here's the team at visit 3, Martinborough Vineyard: Pete Wilkins (vineyards), Janine Tulloch (general manager) and Paul Mason (winemaking): great hosts, got a good feed, and the wines were spot on. Especially liked the rare Shiraz Viognier, and the super-concentrated low yield 2007 Pinot. Good Riesling, too. Final visit, before my drive to Napier, was at Gladstone, in the Gladstone district of Wairarapa about 20 minutes from Martinborough. They're making super wines, but also doing good work with their vineyards. Above is buckwheat, used as a cover crop to encourage beneficial parasitic wasps. It's owned by Scots Christine and David Kernohan (above). Below is one of their vineyards. Over three hours drive to Napier. Went down to dinner on my own, only to meet up with Tim Atkin and later Oz Clarke. A jolly way to pass the time. Syrah symposium tomorrow.